A college class gets more than it bargained for when Harper gives a demonstration of her uncanny talent. Instead of just finding one body in an old grave, she finds two: the original occupant and a recently deceased girl whom Harper had tried, and failed, to find two years previously. To dispel suspicions about her own innocence, Harper and her stepbrother Tolliver undertake their own hunt to find the killer-only to find yet another body in the same grave. I've had this book (and the third one) on my bookshelf for quite some time and decided to catch up on it, since the fourth one's going to be released very soon. I really enjoyed the first one, so I knew this one would be great too. I love the mysteries in this series. And this one was a creepy, creepy one. 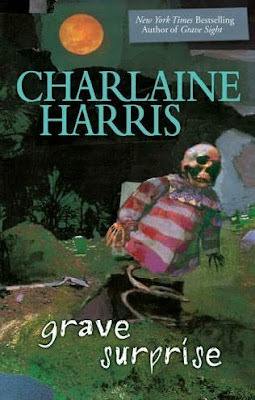 Seriously, when Harper goes to an old cemetery to prove her talent, she ends up finding two corpses in one of the graves. And one of the bodies happens to be that of a little girl she'd failed to find several months back. After that, her and Tolliver find themselves under suspicion from the police, hounded by an FBI agent, and caught in the middle of another family's situation. It's not a happy place to be for Harper. As if she doesn't have enough to deal with. The prejudiced way that others treat her all the time made me angry. Just goes to show how people treat those that are different or they don't understand. :/ It might be a book, but the anger/fear rings true.